How will those changes play out? Where will they take us? No one can be sure yet. But it’s not likely that things in those nations are just going to go back to the way they were. I’m particularly struck by women’s actions in the uprisings in Cairo and Tunis and other cities caught up in this political and social whirlwind. At least for the moment, women are standing beside men in the public square, raising their voices against an oppressive past and for a better future. Dribs and drabs aren’t working. As I write this, a brand-new report has just come out. In honor of International Women’s Day’s hundredth anniversary, consulting firm Grant Thornton International has published a study on the status of women in leadership at top private companies worldwide. The report tells us that in 2011, only 20 percent of leaders in private companies worldwide are women. That’s down from 24 percent in 2010. The largest economies–the G7 nations, including the United States–average 16 percent women leaders. Instead of seeing the current recession as an opportunity to reevaluate and refine operations, companies in these nations are reverting to a “play it safe” mentality instead. But what they are trying to revert to is not safe. The catastrophic 2011 earthquake and tsunami in Japan killed tens of thousands, displaced 10 times more, and crippled a major nuclear power plant. This nuclear plant had supposedly been designed to withstand such ravages; but four reactors are destroyed, risking severe radioactive contamination. A major Girl Scout conference of senior staff from GSUSA and the CEOs of all our 112 councils happened to open four days after the earthquake. One of our speakers, Sally Helgesen, an international consultant on business management and gender issues–whose book The Female Advantage (Doubleday, 1990) is a classic study of the role and potential of women in management–commented that perhaps the most intransigently male-dominated and female-unfriendly group of companies she had ever dealt with was the Japanese utilities industry. It’s not unreasonable to wonder if the decisions made decades ago to put nuclear power plants atop the fracturing junction of Earth’s tectonic plates would have been made the same way if women had sat at the utilities’ leadership table. In 2008 the global economy came close to meltdown at the hands of industries whose leaders proved miserably incapable of controlling the forces at their disposal. Is it coincidence that these industries, too, are almost completely dominated by men? Has anyone learned anything from watching these alleged leaders furiously try to pretend that nothing went wrong, and attempt to re-create the dysfunctional system that so recently collapsed? When you look at this and at the Grant Thornton report, you see the world trying to go backward. Well, we have seen where we came from, and it is not safe there. So what else can we do? I mentioned that Girl Scouting is spearheading a nonprofit-sector celebration of 2012 as the Year of the Girl. But what we really need is a Decade of the Girl, because we need to take a giant step, and we need more than a year to do it. When I was a young girl, Americans were afraid that our nation was falling behind in the new era of space exploration. Then President John F. Kennedy stood up and said we would put a man on the moon by the end of the decade. And we did. This is the kind of astonishing progress we are capable of. We have the ability to–and we need to–make the same great leap of progress in leadership parity within the coming 10 years. We need to put women (not just some women, but enough women) in every boardroom, on every executive team, and within every center of power in the nation. We have tried tokenism, and it doesn’t work. And it isn’t enough for women to just be close enough to hear the conversation; we have to be within it, in order to change it. It is going to take work. Look around you at the girls who are age 8, 9, and 10, and at the high school girls just now earning their Girl Scout Gold Award and learning how the world works. They are our leaders of the future. We need to lift them up. We need to put the equivalent of a moon rocket under those girls and boost them into the vital challenges of leadership. Remember the Girl Scout bridging ceremonies? Imagine a worldwide bridging ceremony. On one side of the bridge are millions upon millions of girls, getting ready to cross. They are of all ages, all sizes and shapes, some bold, some curious, some nervous. They’re figuring out who they are. Imagine the anticipation hanging in the air, the promise of more and better to come. Now imagine the other side of that bridge. That’s the future. Over there is a world in which men and women lead together in a balanced, respectful way. Over there, girls and women are valued not just for what they look like or the things they do that are cute, but for their intelligence, skill, compassion, humor, strength, and even their power. What do you think this bridge is made of? It’s made of people like you and me. It’s made of a father who wants a better future for his daughter. A college-aged young woman who has some extra time and wants to give back to her community. A corporate executive who has noticed that the company and its leadership are not as woman-friendly as they could be. An artisan who wants to pass on her skills. A scientist who wants to encourage others to know the joy of hard study. A philanthropist seeking a cause. Someone who works in an organization that helps adult women to link arms with others. The bridge to the future, for millions of girls, is not some fantasy that can’t be built. The bridge is simply us. Moon rockets don’t come for free, and neither do bridges. We can’t just see the potential of a new world. We can’t just want it. We have to make it happen. Let me tell you some ways Girl Scouts is making it happen. This may inspire you to join us, and that’s good: we need your help. If you’re a parent, and you think your daughter might enjoy and benefit from the things we’ve been talking about, please get in touch with the Girl Scout council that serves your area. Wherever you are, we’re nearby. We’re in every zip code in the United States, and on military bases and in American and international schools in about 90 countries. Call 800-247-8319 or check us out at girlscouts.org. Here’s another option for you: become a Girl Scout volunteer. You’ll be joining a million dedicated adults who apply their talents in dozens of important ways, from the national board of directors (yes, they’re volunteers) to working directly with girls in every Girl Scout council. This million-woman corps makes it possible to deliver the Girl Scout leadership to our 2.4 million girls. And of course in the near future, when we hope our new program of leadership journeys will attract twice as many girls, we’ll need a million new volunteers like you. Volunteers can make a crucial impact in the lives of girls. For example, a year or so ago, a seven-year-old Brownie Girl Scout, whose family was stationed overseas while her father was deployed in Iraq, lost her mother in childbirth. When the girl got the news from the hospital, the first person she called was her troop leader. “Mrs. Beebe, my mommy is dead. I need you.” It was her troop leader, and her sister Girl Scouts, whom she stayed with and who comforted her until her father could return from Iraq. As important as our volunteers are, we haven’t always made the volunteer experience as smooth or easy as it should be. Some women (and men; our male volunteers, who do a wonderful job, often wear T-shirts that say, “Are you man enough to be a Girl Scout?”) have tried to join as volunteers but they came away from the attempt frustrated. Maybe it happened to you. Maybe you were told that if you volunteered, you had to be a troop leader; but you didn’t have the time to commit to that. If so, please get back in touch with us. We’re building many new ways for people with limited time but unlimited passion to contribute to the lives of girls. You may have felt that if you’re not the mother of an elementary school girl, you can’t fit in as a Girl Scout volunteer. That’s far from true. Mothers are the backbone of our volunteer service to their daughters and their daughters’ friends; but we also need women of any life experience, to lend a hand and be role models. We need the energy of young women–in college, or early in their careers–who want to work with and encourage girls only a few years younger than themselves. And we’re finding these volunteers, because we’re making it easier for you to find us and for you to integrate your life and your gifts into what we do for girls. So if we’ve ever discouraged you–or if you’ve ever looked at Girl Scouts and thought, “That doesn’t look like me”–try us again. Let us invigorate your life with new challenges, new training, new leadership skills, and the delight of doing great things for girls. 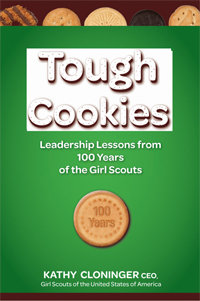 Excerpted with permission of the publisher John Wiley & Sons, Inc., www.wiley.com, from Tough Cookies: Leadership Lessons from 100 Years of the Girl Scouts by Kathy Cloninger, CEO Girl Scouts of the United States of America (c) 2011 Girl Scouts of the USA.